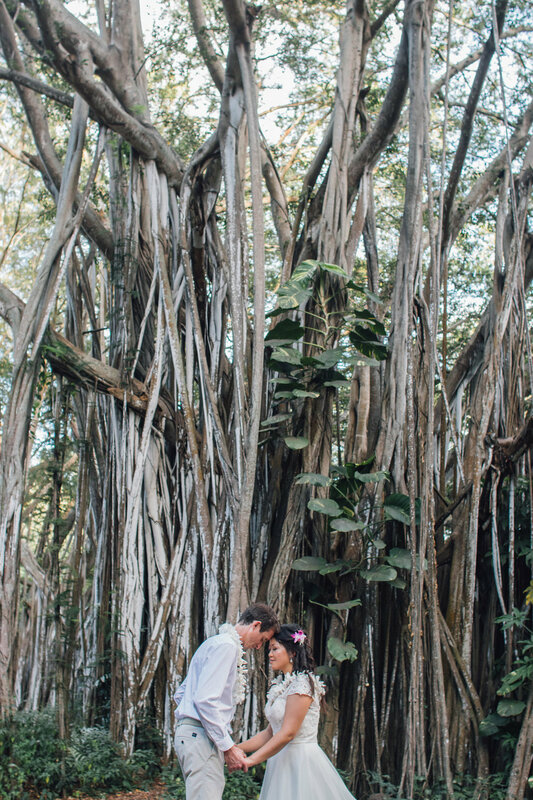 Didi and Luke chose Oahu as their vacation destination and decided to elope at the same time. 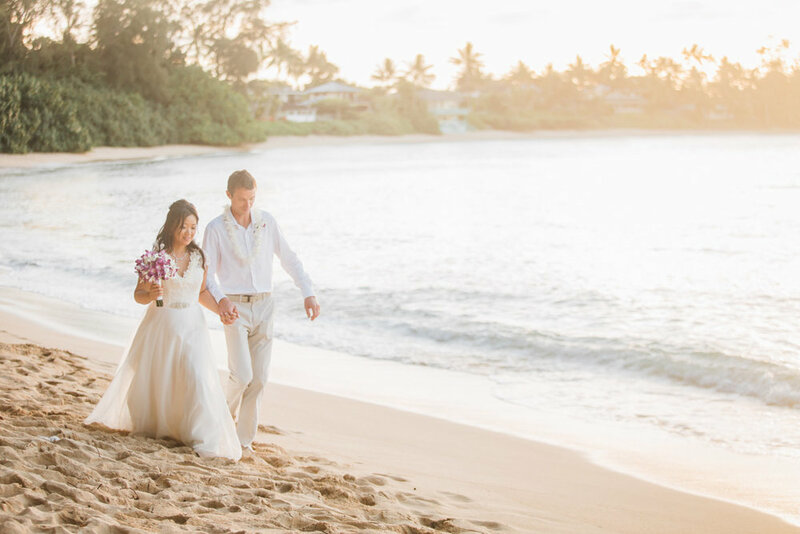 Without a doubt Kawela Bay on the North Shore of Oahu is one of the most picture perfect locations and ideal for small weddings, most notably elopements. Kawela Bay is also very famous for its Banyan Trees and has been used in Hollywood blockbuster films like Pirates Of the Caribbean, Snatched, LOST, Jurassic World and most recently the new Jumanji 2 starring 'The Rock' and Kevin Hart. Its an escape to another world and you quickly forget you are in Hawaii, feeling more like an escape to a deserted island in the pacific. The couple decided on a hidden bride and I made sure Luke was facing away from Didi when she arrived. She slowly walked up behind him, touched his shoulder only for him to turn around and see his beautiful bride to be. I love seeing the grooms expression with that first look, gets me every time. 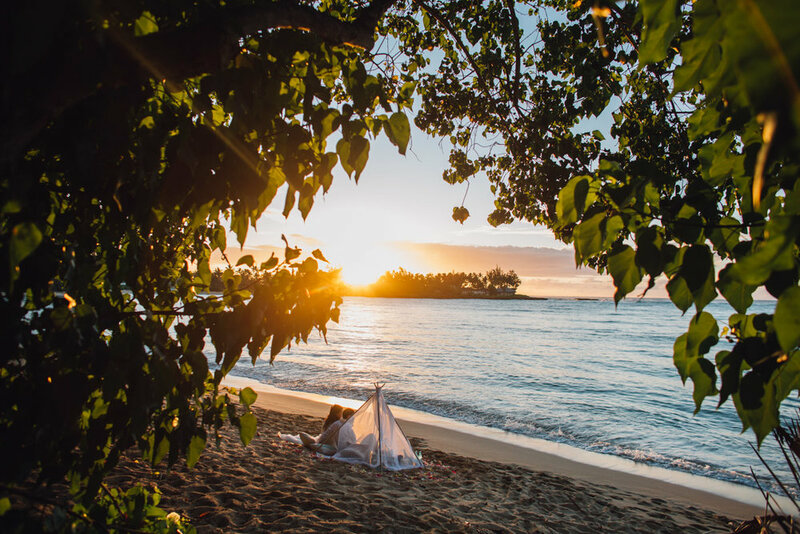 They chose a picnic with a taste of Hawaiian foods and enjoyed a romantic sunset together. All of this was organized with the help of www.marriedwithaloha.com - your go to all in one wedding/elopement planners for all the Hawaiian Islands.